Scientists have created a detailed map of the Milky Way using two large fully steerable radio telescopes in Germany and Australia. The study reveals fine details of structures between stars in the Milky Way for the first time, said Professor Lister Staveley-Smith from the International Centre for Radio Astronomy Research in Australia.The research looked at neutral atomic hydrogen – the most abundant element in space and the main component of stars and galaxies – across the whole sky in a survey known as HI4PI. The project required more than a million individual observations and about ten billion individual data points. Although neutral hydrogen is fairly easy to detect with modern radio telescopes, mapping the whole sky is a significant achievement, Juergen Kerp from University of Bonn in Germany. “Radio ‘noise’ caused by mobile phones and broadcast stations pollute the faint emissions coming from stars and galaxies in the Universe,” he said. “So sophisticated computer algorithms have to be developed to clean each individual data point of this unwanted human interference. Next to the thousands of observing hours an even larger amount of time has been spent creating the final scientific data product released today,” Kerp explained. The survey used Commonwealth Scientific and Industrial Research Organisation’s Parkes Observatory in Australia and the Effelsberg 100m Radio Telescope operated by the Max-Planck Institute for Radio Astronomy in Germany. It improves the previous neutral hydrogen study, the Leiden-Argentine-Bonn (LAB) survey, by a factor of two in sensitivity and a factor of four in angular resolution, said the study published in the journal Astronomy and Astrophysics. 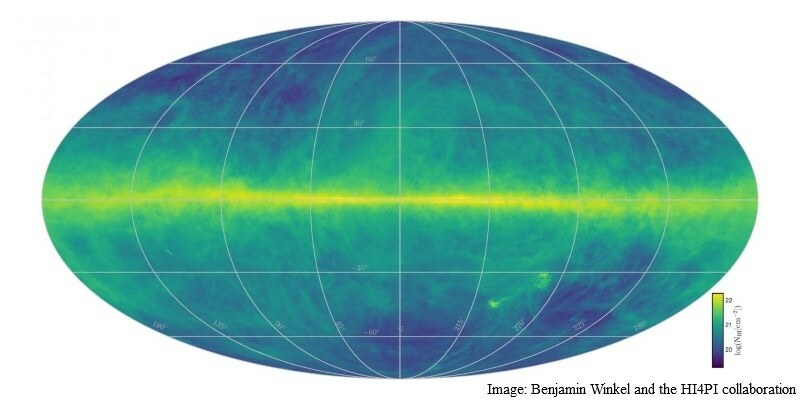 Having a clearer picture of the hydrogen in the Milky Way would also help astronomers to explore galaxies even at cosmological distances, Benjamin Winkel from the Max Planck Institute for Radio Astronomy said.